Do you have a second? Time enough for me to quote an entire book to you? 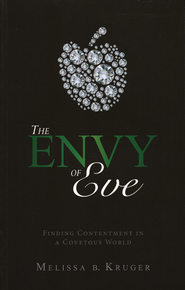 Perhaps you might find it quicker and easier to just pick up a copy of The Envy of Eve and read it for yourself? If you agree to do that, I'll stop talking. But I'll keep talking until I convince you. Fair? This book was recommended to me by two ladies I have deep respect for. First Lisa highly recommended it. Then Melissa quickly followed. I purchased it (because what else could be done?) and then proceeded to sit on it for almost an entire year. Every once in awhile I'd view it sitting on my stack of books and I would feel guilty about not having read it. But there were other "more important" books to get to. As it always seems to be, (because it always is), God knows when I really need to hear a certain message and He puts people, books and sermons in my path to shake things up in my world and cause me to see where sin needs to be confessed and rooted out. Saying "I devoured" this book doesn't seem quite accurate. I spent a long time reading it - longer than I usually spend with books. Although it's only 250 pages, I spent the last month lingering over the pages, underlying passage after passage (after passage), dog-earing the pages, staring off into space, etc. Surprising to myself, I felt as if I could have written this book because I needed it so very much. Kruger wrote admonitions which challenged and startled me - in all the right ways. Kruger opens the scriptures to her readers to discuss and define exactly what covetousness is, how we fall prey to it, and how we can avoid it. The title indicates that she starts with the story of Eve which is true; however, Eve is not the only example she uses to make her valid and Biblical points. She also focuses on the story of Achan, the Israelites, Joseph and others. She inserts passages of scripture straight into the book and provides references aside. Her manner of writing is approachable, friendly and firm in it's belief. She acknowledges her own short comings but doesn't revel in personal examples. Rather, she sticks to scripture to teach. The intended audience of the book is women, which is not to say that it wouldn't be useful to men as well. However, I do believe that she understands women quite well and this book is best utilized by females. Also, it would serve Christian women well to humbly pick up a copy of this book. Coveting is all about looking over the fence into another's life and desiring what that person has as we compare their circumstances with our own situation. I particularly appreciate the fact that Kruger gets right at the heart of what causes covetousness: unbelief. She doesn't worry about not hurting her reader's feelings as she proceeds throughout this book. Don't pick up a copy if you want to go on ignoring your sins. I love that Kruger understands that the removal of sin from one's life isn't a pleasant experience but a necessary one and while she has great bedside manner, she's focused on getting to the root of the problem and getting rid of it. Every page I turned I found myself being hurt and healed, simultaneously, which is what good teaching of the Word of God is want to do. I could see how ugly I've been in wanting relationships to look a certain way, in wanting to be able to play in the rain without getting sick, in wanting to eat out three times a week. Mostly I want things to be easy instead of hard. I can see I have been very whiny. It can be very hard for me to feel joyful in the midst of trying times. Instead I'm apt to feel stressed and overwhelmed. As you may be starting to gather, I had much to think through in the reading of this book. There was and still is much sin to confess. As hard as it was to read some of the things that Kruger wrote, she consistently, faithfully and patiently pointed her readers back to the cross where forgiveness is extended. Yes, I do have a pattern of coveting what others have (specifically in desiring to be in other seasons of life which allow me to sleep as long as I want and have plenty of quiet time to myself). But I need to believe in God's sovereignty. I need to believe that His plan for me is best. It is right. And I need to be grateful, not hiding my wicked, selfish thoughts and nursing them - petting them! - but confessing and asking the Lord to help my unbelief. I am praying that He would help me to see all that I want to believe and have a tough time with. I pray to not be a woman who does not try to take joy from others, but humbly submits to the Potter's sovereign and good hand. Kruger could have written another hundred or so pages and I would have remained riveted on her every word. However, there was no need for her to do so. She makes her points and she makes them well. The reader is left to do the work that they are responsible for: confession of sins, acceptance of forgiveness (for He will be faithful to forgive us all of our sins and to cleanse us from all unrighteousness! ), and a purpose to belief with faith. It is well-written, solid teaching and worth every bit of time and attention that you have to give to it. Alongside Lisa and Melissa I can do nothing more but highly recommend The Envy of Eve . One final note: this book is definitely going down on my top favorites for 2013 and also one of the books that has had the most impact on me, spiritually speaking. I will revisit it again because life isn't over and I don't feel as if I have perfected this lesson by any stretch of anyone's imagination! Thanks for the review! It sounds like a good book to read and have around. Yep, this book will totally get in your business but in the best possible way. Conviction is the kindness of the Lord! This sounds like one I need to read as well! This sounds like a wonderful book and one that we all need to read. I've put it on my TBR list. Thank you for the great review! This sounds like a book we ALL need to read. Thank you for the great review. I've placed it on my TBR shelf!